Republican NYC Mayor Primaries Candidate, John Catsimatidis, CEO Red Apple Group. 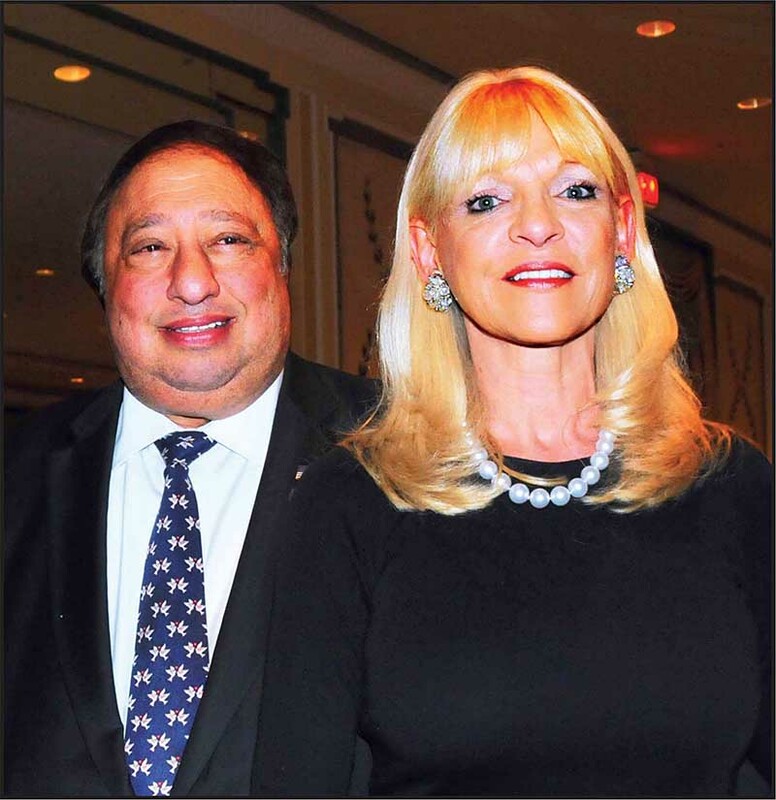 John Catsimatidis and his wife, Margo. On Thursday, August 29th, Henry Levy (HL), Jewish Post Editor & Publisher, interviewed John Catsimatidis (JC), Republican candidate for NYC Mayor at his office on 56th Street and 11th Avenue in Manhattan. Mr. Catsimatidis was very open and forthcoming, gave his honest opinion to our questions concisely and to the point. In other words, he was a typical New Yorker. Also, not the typical politician who never seems to answer the questions that are asked. A special thanks goes to Dr. Sal Cumella, executive producer of Women for Women, for making this interview possible. JC: Last night I met with the Lubavitch and as you can see in the photo on my wall, for the past 25 years in a row, I lit the candle (for Hanukkah) on Central Park South. HL: When people hear that a multi-millionaire or billionaire is running for a high profile office, usually money is not the objective, mainly it is for power or for ego. If it is for ego in your case, is that necessarily a bad thing or a great motivator? JC: No, I think that people who do it for ego should not do it. I’m NOT doing it for ego. In fact let me give you a prime example. Four years ago I had the nomination and Bloomberg came to me and said he wants to do a third term and I gave it back to him without a fight because I felt that he could win easier than I could at that time and I cared more about the city going in the right direction than I cared about me getting it. Now, this time around, between my opponent and myself, we’re going to spend in the primary alone over $10 million. I’m doing it because I’m going to help New York. Look, I grew up in Harlem, if my parents were here they would be proud because we were new immigrants and became more successful than we could ever dream about. I’m doing it to pay back our city and I’m doing it for the right reasons. HL: What is your vision for the future of New York City? JC: I think between Rudy (Guiliani) taking it to a safe position in our streets and then Bloomberg raising it to even higher level, my interest is to raise it to an even higher level than that. You know when a professional politician says to you we’re going to be short two billion dollars, the translation is your taxes are going to go up. Compare that to a businessman, a non-professional politician, who looks at a two billion dollar shortfall and says, “Okay, how can we fix it without raising taxes?” I think that’s the key thing because professional politicians don’t know how to visualize anything other than making up a deficit by raising taxes. What I want to do is to keep our streets safe… to keep them safe from hoodlums. I visited three senior citizen centers this afternoon. Do you know what they are most concerned about? That they don’t take away our food and our rights and that they keep us safe. Starting January 1st I want to keep our streets safe and keep the lawsuit going trying to get rid of the police monitor. Number two, keep Ray Kelly’s terrorist force which is going to protect us from terrorists, in addition to the FBI. Number three, we freeze all taxes that the Mayor has control over. Number four, we fix the education system because we have dropout rates that are unacceptable in our city. I want to create more vocational jobs and training. Instead of kids dropping out let’s teach them how to become mechanics, carpenters and plumbers, that way they can earn a living instead of dropping out. We need more health care workers. We need more mid paying and low paying jobs. We must freeze the taxes. New York ranks number fifty (the worst) in states in terms of maintaining our citizens, and stopping our high earning citizens from leaving because they are going to states with less taxes. You know what happened in Detroit? Everybody left. We’re not in danger in the next year or two, but if we keep going on I would say over the next five or ten years, if enough people leave we will not be able to cover our bare essentials. HL: You started in the grocery business, it’s a very tough business to make a profit at and over the last years a lot of small business people have found it incredibly hard to stay in business. It has affected certain industries such as the furniture business which has been decimated. How would you address this problem? JC: When I meet these people, I meet with small chambers of commerce and restaurant associations, you know what they realize when they talk to me? I am one of them. I feel their pain because I’ve gone through the same things. Gristedes, which used to be a much bigger company, through all our chains we were doing a few billion dollars and we had ten or fifteen thousand employees, fully unionized, and we shrunk it down to thirty two stores which represents three percent of our total corporate sales. Why? It’s a tough business and it’s a problem. HL: A lot of those stores are still in low income areas. What would you do if in those low income areas, it was hard to keep those stores open and yet you were the only supermarket there? JC: We are going to get to that point. So far, when the company needs money our parent company gives them extra money but the joke around town is that if I didn’t have Gristedes I’d be higher up on the Forbes list. It’s not a profit making organization. I’ve kept it open because a lot of the employees that work here have been here over thirty years. You know, I have leadership, I’m tough, but I have another problem. I have a heart. HL: What programs do you have to help these small businesses that are having such a hard time? JC: We get deliveries from Hunts Point Market to our stores and we get $4,000 to $5,000 a week in parking tickets. We have a certificate of occupancy to operate a store and we can’t get a delivery from Hunts Point Market without getting a ticket. Now, that’s not fair. We get tens of thousands of dollars of water bills without explanations. We get fines, permit fees … the industry, small business people under Bloomberg have been hurt because the amount of regulation and the amount of permit fees and fines are excessive. When I talk to these small businesses they know that I am sensitive to their problems, because they are also my problems, and it is in all of our interests that they be addressed and solved. Who better to solve them than the man who lives with them? HL: Are there any agencies that you would consider disbanding, reforming or creating new ones? JC: You have the Consumer Affairs Agency that takes care of consumers. We want a Small Business Authority where a small business can go to complain about another agency, where there is someone, an ombudsman, who will defend the rights of small business people within our city administration. HL: Today there are more people out of work, more people on federal assistance, getting food stamps, there is even a tremendous amount of advertising asking people if they applied yet for assistance. It seems to be a path to greater reliance on the government but a potential disaster because where is all the money going to come from? How would New York handle that? JC: Well, I think every city, every state had to pull in their belt a little bit. I think that common sense has to prevail sometimes. I know the law and the federal government has forced us where if somebody gets on a bus for instance in South Carolina to New York and is homeless, and we have to support them. Rudy Washington, a former deputy Mayor now advising Catsimatidis added, “The courts force us to take them in. We’re talking about a family on the west side, costing the city a quarter of a million dollars a year.” Rudy indicated that with a cost to the city of about $300 million, it would be cheaper to pay each person $70,000 a year and they would be better off as well. Clearly there has to be a better way to deal with situations such as this. HL: You have your early roots in Harlem. HL: And you worked in your initial grocery stores that were there as well. What connections and friendships that you made then, have stayed with you? JC: Last week I was at Sylvia’s (Harlem’s renowned restaurant), and my friends in Harlem gave me a big party and I felt at home. HL: Are you aware that there is an effort to save the Harlem Armory, the home of the 369th Harlem Hell Fighters, the first black U.S. fighting force? JC: The Police Athletic League (which Catsimatidis actively gives his time and support to) had utilized those facilities. The problem is, the place is so big. They are trying to figure out more usage for it. The location is great because it is right in Harlem on the East River Drive and I have helped kids there all the time. I would love to have more information about the committee that is trying to preserve the armory as a museum and also for its original purpose as the home base of the 369th Infantry Regiment. HL: In 2012 there was a situation in the Hasidic are in Brooklyn where the father of a young boy said his son was abused in a religious ritual bath and he tried to bring it to the attention of the authorities and he got nowhere. He got nowhere with DA Hynes. In fact for this father going public the Jewish community ostracized him and his family for even talking about it. They said it should be dealt with through the rabbis not the police. When it was brought to the police, the media scrutiny and the outspoken commentary by the late Ed Koch on Hynes, made the DA deal with the problem. It was a disgrace that a citizen was shunned by his own community and put in that position. That religious sect represents a very important voting block. What are the problems in terms of trying to appeal to an important voting block versus helping a local citizen facing these odds just to stand up for himself and his family? Rudy Washington (RW): There is a difference between our laws and religious laws. In Europe there are some efforts to impose Sharia law. As Americans we do not have dual legal systems. JC: There was a big discussion in the Jewish community dealing with circumcisions where a child could possibly catch a disease and even die as a resulting from a rabbi sucking out blood by mouth when his mouth is infected and diseased. The community is insisting that the religion should prevail and this practice should be allowed to continue. Bloomberg called for a certificate of health or a parental waiver of responsibility. I do believe in religion prevailing but the religious (community) should look at it themselves and make their own decisions. We should also be aware that the child doesn’t have the ability to defend itself. HL: What are the activities relating to the Jewish community and Jewish organizations that you are most proud of being involved in? JC: I’m actually a board member of Rabbi Arthur Schneier’s Appeal of Conscience Foundation for 28 years. I spoke to his synagogue (Park East Synagogue) a couple of weeks ago. For the Greek Orthodox Church I’m in charge of religious freedom rights. We work very closely with the Catholics and Orthodox Christians, and with the Jewish people. I look for ways of bringing us all together which gives us a better chance for peace in the world. I also worked on the Holocaust Museum with Mr. Morganthau who I am very close with. HL: There is a horrible situation in Egypt right now. The Coptic Christians are getting killed. JC: I think Obama is 110% wrong. He got rid of Mubarak. Good or bad, Mubarak was our guy for 30 years and what we got was something worse than what we had. It was horrible that they allowed Mubarak to be put in a cage in the middle of court, on CNN, for the world to see. I said to a few Senators, how many other prime ministers around the world are standing in line to be our ally now? Nobody! I have problems with the foreign policy of our country. I think is has to be more consistent than changing every four years. It has to have a better memory. We have to show support for Israel ... they are our allies and we have to be aware of what is going on around there because it could start a bigger problem. HL: Speaking of foreign relations, with the United Nations in our city, it puts the Mayor of New York in a very interesting position. JC: I would say the Mayor of New York is second to the President of the United States as far as dealing with foreign entities. He doesn’t do it on a day to day basis but you need a Mayor that respects what goes on. RW: The city has a department that deals with consulates and we assist all the members of the U.N.
HL: As Mayor, you do have to be in touch with all the ethnic communities. What about utilizing connections with the consul generals and ambassadors to accompany you? JC: Let me tell you how close we are. I’m the only Republican … I have marched in the Greek Parade, I marched in the Israeli Parade, I marched in the Indian Parade, Pakistani Parade, Dominican Parade, the Puerto Rican Parade, the Italian Parade – I was made a member of the Columbus Club recognizing that I have some Italian blood in me. I met with the Haitian community and seven out the eight airplanes used by the Haitian government are our airplanes. In the Virgin Islands we had the Grand Union operation, the Pantry Pride operation in the Grand Bahamas, and we’ve done business in almost every Caribbean island. We had Capital Airlines that used to fly to the Caribbean. I have a financial presence besides just being a New Yorker. I also helped put together the 2004 meeting between the Patriarch of Constantinople, the Eastern Church and the Pope from the Vatican, the Western Church which was only the third meeting of its kind in over 800 years. We have continued those meetings along with Pope Benedict who went to Constantinople in support of Patriarch Bartholomew, which ticked off the Turkish government because they don’t like Christians and Jews. The government doesn’t like them, the people really don’t care. The people are very nice. HL: I think the more recent Turkish government fits that mold to a certain extent where in the past it was not that way. I was in the Peace Corp in Turkey for two years. When I was there, as a Jew in a Muslim country, they kept saying how much they admired what Israel did and were shocked at how little Israel’s Arab neighbors accomplished. JC: I’ll give you a quick story. I was involved in assignments from Presidents of the United States that I really can’t talk about, but I recently chose to talk about one of them because it was strictly a peaceful pro people situation. President Clinton sent me to Greece after the earthquake in Constantinople (Istanbul) in 1999 and asked me based on the European community approval of 300 million euros, in aid for Istanbul and the Greeks put a block on it. The President sent me to see Greece’s President Stephanopoulos and Minister George Papandreou to ask them for a personal favor to release those funds to the people of Turkey and I got it done. Papandreou personally delivered the check. HL: I knew about the situation but didn’t know about you until now. JC: A short time later, Athens had an earthquake and Turkey sent aid. HL: I remember that as well. JC: I met with Prime Minister Erdogan about a year ago and I told him this story. He didn’t know where the money for Turkey came from. I could tell you stories that would make your hair turn black. HL: (the guy with the white hair) … Wow! I welcome those stories! HL: Are you familiar with the Jewish Children’s Museum in Brooklyn? Let me tell you why it started. This 16 year old boy, Ari Halberstam, an orthodox Jew, was in a school van crossing the Brooklyn Bridge in March 1994 when he was shot and killed by a fanatic Muslim filled with hatred toward Jews. Ari’s mother, Devorah, decided she was going to build a museum with a focus on educating everyone in the city about what is was like to be Jewish but also geared around the whole concept of tolerance and promoting harmony and understanding through education. The Lubavitch backed it. Governor Hugh Carey supported it. Devorah built it. It is a six story structure. They have had over one million visitors, mostly schoolchildren from all around the city. It’s a wonderful way to teach us in a time when there is so much intolerance, especially at a young age, how we can turn that around. Is the kind of organization you would like to learn more about and get behind? JC: The answer is yes but I can’t do it right now (because of the election). My primary thing is I need your support, I need their support. I need the support of registered Democrats. HL: Let me tell you where I was before I came here. I do some charity work for the American Kidney Fund and I know that Dr. David Cohen is the one who performed your kidney transplant and you and Dr. Cohen were honored in March at their event. JC: Dr. Cohen is a wonderful man. HL: The Kidney Fund just honored me today at a luncheon for helping them out. JC: Thank you for helping them. HL: We all have to do what we can. Before I left their luncheon I told them I was going to be meeting with you. Of course that elicited an unbelievable response. They shouted, “Catsimatidis, he was so wonderful to us, so generous, give him our regards.” I asked them if there was anything they wanted me to say to you. Their director for the New York region said, ask him if he would be our honoree for our golf outing. JC: I have a serious problem. I only eat, I don’t play golf. 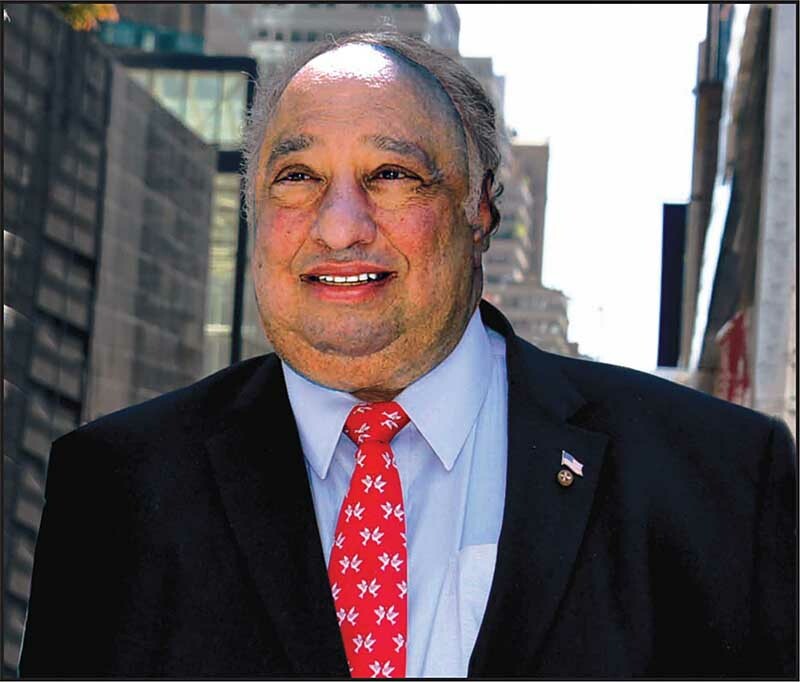 Editor’s note: John Catsimatidis supports so many charities, hospitals, and good causes, with no concern for the publicity, merely for the acts of kindness themselves, that he should be an inspiration for us all regardless of our station in life. HL: Mr. Catsimatidis, I understand you have an event in Brooklyn you must attend and I thank you for allowing the Jewish Post let its readers learn more about you as a candidate and as a man.